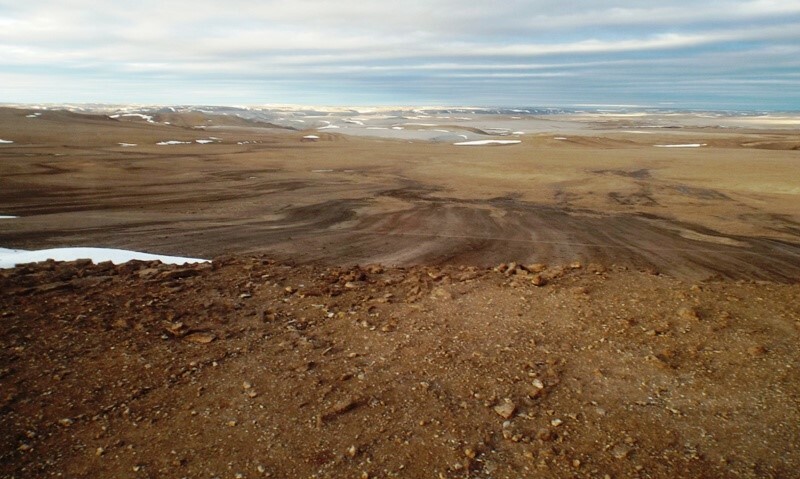 One of the primary justifications for the location of F-MARS here on Devon Island is the presence of the Haughton impact crater (Zubrin 2004). This is one of the most studied impact craters on Earth. Useful summaries can be found in the 2005 issue of Meteoritics and Planetary Science (Volume 40, issue 2), covering geological and astrobiological questions. A key paper to this is Osinski et al. (2005), and is accompanied by the magnificent geological map of Osinski (2005). In addition to the field science questions, the location allows exploration questions associated with specific equipment tests (Pletser et al. 2009), human factors (Bishop et al. 2010), and operations (Osinski et al. 2010) to be addressed. For me, one of the interesting aspects of being here is considering the similarities and differences between Haughton Crater here on Devon Island (Figure 1) and Endeavour crater on Mars . These are summarised in Table 1. The comparison illustrates the nature of analogue work. It’s as important for analogue researchers to understand the differences as well as the similarities between the two settings to best understand the results of the work here. Haughton is of particular interest when compared with Endeavour crater on Mars because of the work carried out by the Opportunity rover mission there and because of the potential of Endeavour crater to be a target for future crewed missions (Clarke et al. 2017). This was covered in my first science report. The two craters have every similar overall diameters, as far as can be determined from subsequent erosion. Both are about 22 km across, although the visible depression of Haughton crater is somewhat less than this, about 16 km from rim to rim. The degree of erosion is similar, between 100 and 200m in each case. However Haughton crater is much shallower, this may be due to the higher gravity of Earth and the weaker target materials, sedimentary rocks rather than basalt. These two factors change the way the surface of the surface of the target respond to the force of impact. The two craters have not only formed in different materials, but are also of very different age. Haughton crater is very young, only 29 million years old. Endeavour crater is much older, probably about 3.5 billion years old. It is better preserved that Haughton crater because the rates of erosion on Mars are much slower. Endeavour crater has not experienced the erosion by glaciers and rivers that have worn down the landscape of Devon Island. Figure 2. 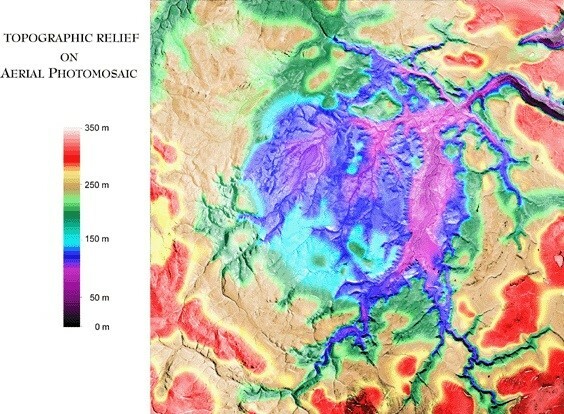 Digital elevation model (DEM) of Haughton crater showing the disconnected outer rim 23 km across, the central depression 16 km across, and the Haughton River draining to the northeast. Source unknown. Endeavour crater appears to have been largely filled during the Hesperian by salt lake sediments of the Burns Formation. These deposited sulphate salt and iron oxide rich sediments. The crater is now being exhumed from beneath this cover by wind action. Haughton crater has had less extensive infill. For several million years during the Miocene the crater hosted a lake, the sediments of which record the animals and plants that inhabited Arctic Canada during this time. Haughton crater is presently drained by the Haughton River (Figure 2), that prevents the lake from reforming. Water erosion is the main way in which sediments are currently being removed from the interior of the crater. During the last glacial maximum however, the crater was completely filled by ice to a depth of many hundreds of metres, but erosion was limited because the ice sheet was cold-based, meaning that it was largely frozen to the underlying terrain (Dyke 1999). Views across the two craters are shown in Figures 3 and 4. I know I have shared these two images before, but they do make a beautiful contrast. 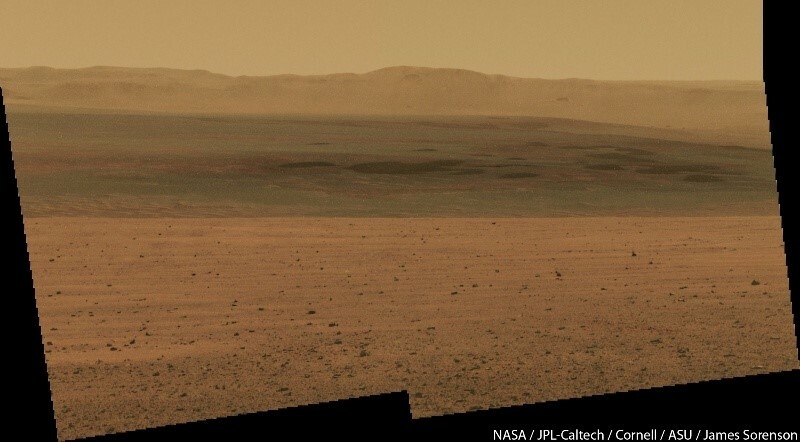 One view is from our window here, the other was captured by the Opportunity mission team by their rover. Two craters on two planets, but a common goal. Figure 3. View across Haughton impact crater from FMARS on Haynes Ridge. Horizon is formed by further crater wall, 16 km distant. Figure 4. View across Endeavour crater, photographed by the Opportunity rover team. Horizon is 20 km distant. Image compiled by James Sorenson. Bishop, S., Kobrick R., Battler, M., and Binsted, K. 2010. FMARS 2007: Stress and coping in an arctic Mars simulation. Acta Astronautica 66,1353–1367. Clarke, J. D. A., Willson, D., Smith, H., Hobbs, S. W., and Jones, E. 2017. Southern Meridiani Planum – A candidate landing site for the first crewed mission to Mars. Acta Astronautica 33: 195-220. Dyke, A. S. 1999. Late Glacial Maximum and the deglaciation of Devon Island, Arctic Canada: support for an Innuitian ice sheet. Quaternary Science Reviews 18, 393-420. Grant, J. A., Crumpler, L. S., Parker, T. J., Golombek, M. P., Wilson, S. A., and Mittlefehldt, D. W. 2015. 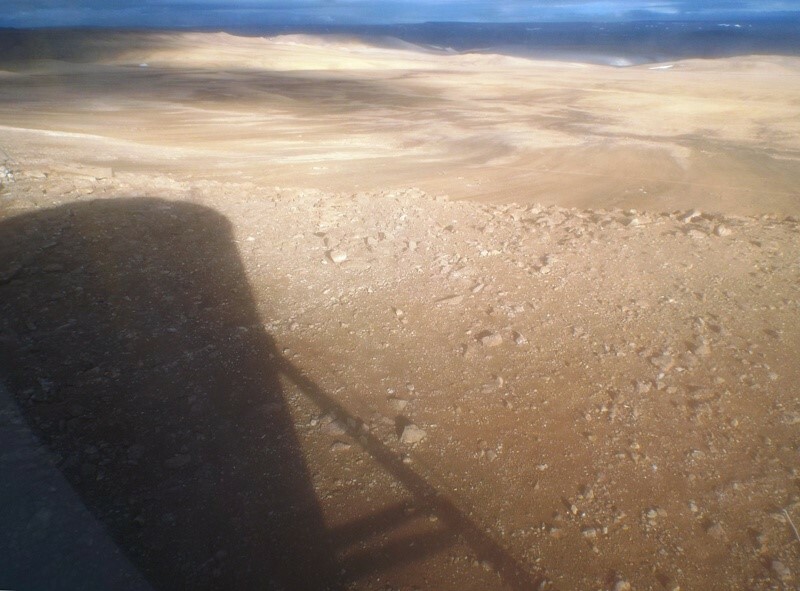 Degradation of Endeavour Crater, Mars. Icarus, in press. Hynek, B.M. and Phillips, R. J. 2008. The stratigraphy of Meridiani Planum, Mars, and implications for the layered deposits’ origin. Earth and Planetary Science Letters 274, 214–220. Osinski, G. R. 2005. Geological map of the Haughton Impact structure, Devon Island, Nunavut, Canada. Supplement to Meteoritics and Planetary Science 40(12). Osinski, G. R., Lee, P., Spray, J. G., Parnell, P., Lim, D. S.S., Bunch, T. E., Cockell, C. S., and Glass, B. 2005. Geological overview and cratering model for the Haughton impact structure, Devon Island, Canadian High Arctic. Meteoritics & Planetary Science 40(12), 1759–1776. Osinski, G. R., Lee, P., Cockell, C. S., Snook, K., Lim, D. S. S., and Braham, S. 2010. Field geology on the Moon: Some lessons learned from the exploration of the Haughton impact structure, Devon Island, Canadian High Arctic. Planetary and Space Science 58, 646–657. Pletser, V., Lognonne, P., Diament, M., and Dehant,V. 2009. Subsurface water detection on Mars by astronauts using a seismic refraction method: Tests during a manned Mars mission simulation. Acta Astronautica 64, 457–466. Zubrin, R. 2004. Mars on Earth. J. P. Tacher/Penguin, 351p.